Strengthening inter-parliamentary relations ”will certainly contribute to the development of relations between our countries,“ the Chairman of the State Duma believes. He reminded that the relations of the Russian Federation and Italy have a long history: “We must pay tribute to Silvio Berlusconi, who did a lot for the development of relations between our countries.” Viacheslav Volodin noted that he and Russian President Vladimir Putin laid the foundation for the development of relations between the two countries. Viacheslav Volodin noted that at the same time the economic relations between Russia and Italy have declined as business cooperation was largely reduced due to anti-Russian sanctions of the EU countries. The Chairman of the State Duma pointed out that Italian exporters lost more than 12 billion euros due to sanctions, mutual trade decreased 2.5 times. “Of course, this cannot but worry us,” he said. “Our relationship is time-tested. Therefore, it would be right to return to the issues of more active cooperation in the economic field as well as in the field of culture, the implementation of humanitarian and educational projects,” said Viacheslav Volodin. The Italian Parliament can play a big role in this, he stressed. The Chairman of the State Duma announced that mutual tourist flows are growing. Thus, 849 thousand Russian tourists visited Italy in the first 9 months of 2018. “This is more than in the same period of 2017. The flow of Italians to Russia is also growing,” he said and called the growth in tourist traffic a good indicator of relations between two countries, two nations. The exchange of students and teachers is also developing: since 2012, the number of Italian students studying in Russia has more than doubled. She noted that after the “failed three years” (2014–2016), when a significant decline was noted, 2017–2018 “show us at least a positive trend, which allows us to hope that our efforts will succeed”. “The importance of strengthening ties and harmonious cooperation between Russia and Italy, Russia and the European Union, Russia and the West, in general, is also very important because of the fundamental role that Russia plays in finding a balance in so many conflict situations that are observed on the world stage,” stressed Maria Elisabetta Alberti Casellati. There are many applications of such cooperation. ‘Russia performs the most important function of stabilizing the situation in conflict zones, in the fight against terrorism in all its manifestations,’ said the President of the Senate of Italy. This is the first visit of Maria Elisabetta Alberti Casellati to Russia and the first in almost 10 years visit of the President of the Senate of Italy to the Russian Federation. 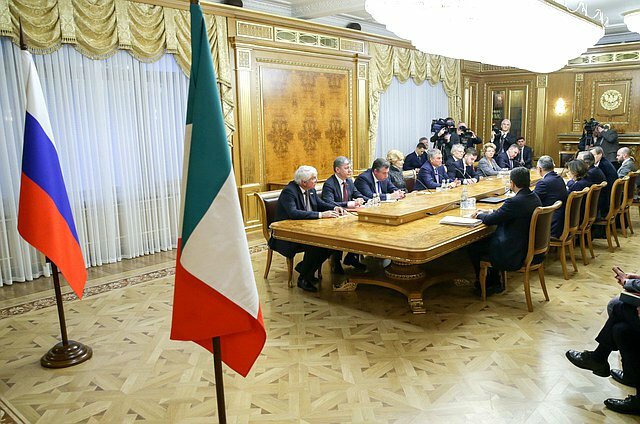 At the end of the meeting, the Chairman of the State Duma invited representatives of the Italian Parliament to take part in the Forum on the Development of Parliamentarism, which will be held in June 2019. “We have a great potential for resolving controversial issues, and each new summit gives an additional positive impetus to bilateral relations between Russia and Japan, bringing the likelihood of a peace treaty closer,” Zhelezniak said. The parliamentarian hopes that negative foreign policy factors and the pressure of extremist forces within Japanese society will not be able to block the negotiation process and the world community will react to the wish of Russia and Japan to legally secure open good-neighborly relations with responsibility and understanding. “Obviously, Russia and Japan have hard work ahead to fulfill the task set by the heads of state on preparation for the signing of a peace treaty, which is necessary to bring our relations to a new level,” he said.